Blasch Precision Ceramics, Inc., an Albany-based ceramic technology manufacturer, announces the appointment of Mr. Shailesh Dayal as Regional Sales Manager, heading up Blasch’s newest location in Agra, India, focusing on petrochemical and refining facilities in the Middle East and India. 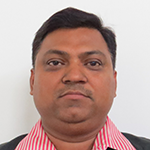 Mr. Dayal, a ceramic engineer with more than 17 years of experience in the oil and gas and petrochemical industries, will cover Middle East Gulf States and the Indian hydrocarbon processing markets. Mr. Dayal’s extensive background includes demonstrated expertise in business development in those industries. In this role, Mr. Dayal will focus on the continued commercial deployment of the Blasch VectorWall™ mixing checkerwall system for refinery sulfur recovery systems as well as other product lines in other process areas, and will serve both new and existing customers.